There’s hard realism in these pages about the social devastation caused by hurricane Katrina. Maybe it’s as frank and true and graphic as you’ll find anywhere. You’ll read much about the disaster early in the book. Street-level. Then as pages go by, the more particular story tends to float and slog along with the murky waters of the flood. There is only so much one can say about hell and its parallels on earth before melodrama takes hold. 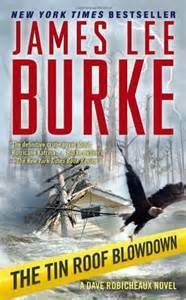 Around the chaos of Katrina’s aftermath, Burke weaves a bad-guys-are-really,really-bad adventure. The pair of good guys Dave Robicheaux and his pal Clete Purcell strive to make things right. The storyline has its share of sudden shocks, twists and pitfalls, but I was wishing for the less-gloomy violence and pathos found in his other novels. The narrative voice jumps from first person Dave to omniscient and back. It’s something crime writers often do, and they usually pull it off (to some extent) without any of their readers noticing. In this case, it may be overdone. I was prone to lose the narrative connection, that familiarity I had on page one when Dave talked about his time in Vietnam and its horrors. Burke’s POV “author” is conveniently all over the place. When we return to our man Dave, all the god-like narration in-between seems odd. The New Orleans storm account (like the event and the nation’s reactions) is heavily laden with underlying questions of racism. Burke’s writing rides the razor’s edge between sympathy (for the flood victims) and loathing (for those who capitalized on the scene via criminal acts). There are some interesting factoids (and euphemistic epithets) thrown forth. For example: in the moments of urban rioting, there are two businesses that are always spared and not burned or looted (by the “Snoop Dog fans”)- funeral homes and the offices of bail bondsmen. Burke does not intellectualize nor direct this into a statement novel. There is a hint, but no mention of the “disaster capitalism” that Naomi Klein suggested as an intentioned by-product of Katrina. One thing for sure… lots of guns are everywhere, and that seems okay with everyone. In that sense I found the story angle a bit Republican in flavor, and it made me want to put the book down or at best hurry through to the end. The Robicheaux books are written to be simple and very personal (with the hero’s touching family scenes, etc.). The texts have a salty Gulf Coast flavor, not unlike David Lindsey’s Houston detective books. Difference is, the hero of Lindsey’s series, detective Stuart Haydon, drives a Jaguar and has refined West University sensibilities. Dave R is simple and down-home. Whether in New Orleans or New Iberia, he’s an enlightened blue-collar Cajun type. The story is what it is – a fiction writer’s vision. But the account — the factual witnessing of the atrocious and tragic events during and after Katrina, that’s really what sells the book. Posted in booknotes on June 22, 2015 by Wm P.